Money can buy you a costume for Halloween, but you cannot purchase your own salvation. Here is your “Cup of Joe with Marko” and my reflections for Reformation Day and Halloween, October 31st, 2010. If you did not know, Halloween and Reformation Day happen every year on the same day: October 31st. The longer name of the 95 Theses continues “…on the Power and Efficacy of Indulgences,” which is to say that Luther was starting a conversation on why the church ought not to be taking money to forgive people’s sins. Just so we’re clear: in those days, people would PAY MONEY to get a piece of paper, an “indulgence” (something like a receipt) telling them their sins have been forgiven. Some of these “priests” went so far as to offer indulgences to forgive a whole lifetime of sin (even the ones you haven’t committed yet), the sins of your dead parents, and the sins of your children not even born yet! This is not only ridiculously hilarious, but a horrible perversion and twisting of the Gospel. Money CAN buy you a costume so you can go out and get free candy on Halloween, but money CANNOT buy you freedom from the guilt of your own sins. There is a payment to be made for our sins, to be sure (Hebrews 9:22), but we could never pay it. The Gospel is this: that through the life, death and resurrection of Jesus Christ, God saves sinners. (period). Its that great exchange: Jesus in place of me. He gets my death, I get his life. Romans 6:23 says that if we do anything wrong against God, we deserve death, but on the other hand that there is a free gift of eternal life (salvation) through faith in Jesus Christ. Only Jesus removes guilt. Only Jesus gives hope. The perversion of gospel through the indulgences was not that the church was offering hope to a people who needed it, but that they were teaching that this hope could be bought with money. These guys were charging for something that was already free! It is God, not money, who saves sinners and gives us hope. 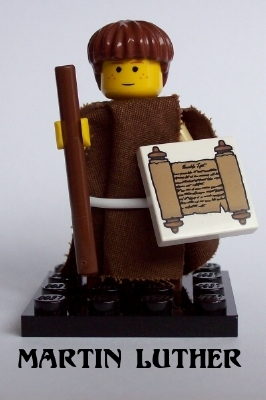 So really, what I should do is dress up as Martin Luther for Halloween, get free candy & talk to my friends about the Gospel which cannot be bought with money. Did you ever find a Martin Luther costume? Thinking about doing it this year to celebrate the 500th anniversary but can’t seem to find anything other than a generic monk costume.